Hi folks! Time for another photo share, and this theme is going to be WINTER. Yeah, I know most people think I'm a wackadoodle for enjoying winter as much as I do, but what can I tell you, I love it! For me there is a breathtaking beauty that winter provides--the barrenness, the rawness, the monochromatic color. I also love how everything slows down in winter; bringing with it a sense of reflection, quietness and stillness. Yup, I find immense pleasure and splendor in winter. So in honor of this season, I invite you to submit a photo depicting a winter scene. It can be a landscape, cityscape, or people photo--so long as it has to do with winter. -This photo share is open to anyone who reads my blog. -Submit only ONE photo that you’ve chosen (I request that you don’t send 2-3 and ask that I choose). -Your photo should be no wider than 540 pixels (please resize before sending). You can resize your photo here. -Include your name (real name or blogging name) and your blog title and URL, so that I can credit your photo and link it back to you. -You are more than welcome to share a photo with your watermark on it. -Also, feel free to add an overlaying title or quote to your photograph. Be as creative as you wish! -Deadline for submission is Wednesday (January 1st) by midnight. I will post ALL photos, but may have to publish them on two separate posts. I will post them in the order they are received. You will find my email address on the contact page below my header. Feel free to ask any questions in your comments. So don’t be shy, send in your photo of WINTER! Have a warm and cozy weekend everyone! Brrr! I shivered just looking at that shot of Central Park. Excellent, photos, btw! I'll start digging! LOL I have a few bazillion photos I can choose from. *snickering* Of COURSE I like the last idea bestest! Happy cuz-it's-getting-closer ALMOST New Years! Hey, Ron, nice photos! I've made no secret of my dislike for cold weather, but I do respect your craziness. As far as the photos, I'd love to send you a picture of me running around a beach in Hawaii, but that doesn't seem likely. I'll rummage around and see if I can find something worthy of your most awesome photo share! Have a c-c-cool weekend, buddy! Ron, I so enjoy when you post these photo shares because it's so fun to see what your readers send in. I wish I were camera savvy because I would love to join in. Love the the theme you've selected. "For me there is a breathtaking beauty that winter provides--the barrenness, the rawness, the monochromatic color." I agree, and that's what I miss about not living in the north east anymore. I miss the experience of having a real winter in Florida. "Brrr! I shivered just looking at that shot of Central Park." OMG...it was FREEZING that day.I took that shot about two years ago when I went to NYC in January. The view is of Central Park South. *snickering* Of COURSE I like the last idea bestest!" HAHAHHAHAHA! You crack me up, woman!!! And I'm glad to hear you'll be sending a photograph because I know you must have a bazillion from all the beautiful shots you've shared on your blog! P.S. Yup...it's almost New Years, can you believe that?!?! Thank you :) I thought of you when I shared the one of Central Park in New York City! I took that photograph about two years ago in January. It was freezing that day, but I loved it! "As far as the photos, I'd love to send you a picture of me running around a beach in Hawaii, but that doesn't seem likely." " I'll rummage around and see if I can find something worthy of your most awesome photo share!" Yes, please do, I'm looking forward to it! Much thanks for stopping by, buddy. Have SUPA' weekend! Thank you :) All three of these photographs I took about 2 years ago. I had them hosted on my Flickr account. ".I'll have a browse for a suitable picture but I think all mine have been seen over and over and over and over and .... a lot. However, if snow comes I will gladly get a few shots." Feel free to send one in anyway so that I can share it with everyone who might not have seen it here, because to them it'll be something new! Also, your photograph doesn't have to have snow in it, just a photograph taken during the season of winter. Much thanks for stopping by, dear lady. Have a fabulous weekend! "I wish I were camera savvy because I would love to join in." Oh, you don't have to be camera savvy to submit a photo. You can even use your camera phone to take a photograph. So think about it. "I agree, and that's what I miss about not living in the north east anymore. I miss the experience of having a real winter in Florida." It's funny because when I first moved to Florida, I didn't miss having the experience of a real winter. But after 20 years, I found myself MISSING it. I'm so glad I moved back to the north east. And not only because of winter, but also because of the seasonal changes. LOVE them!
" The photo of Central Park makes me miss New York *sigh*"
I'll be going into NYC sometime in January, so I'll be posting more photographs next month. Can't wait to get there! Great idea, Ron -- and I can hardly wait to see the winter scenes your blogging friends come up with! I'm still in the deep South, so no snow here, but at least I can "enjoy" the snow your blog will be decorated in soon. And if you really want a Southern winter scene, just say the word and I'll send you one! Happy New Year, my friend. Hugs to you! OK, my photo has been sent! Looking forward to seeing all of these, because - as you know - I share your wackadoodle-ness and love for all things winter. If I don't talk to you before then, have a Happy New Year! Yup...I got it and thank you!!!!!
" Looking forward to seeing all of these, because - as you know - I share your wackadoodle-ness and love for all things winter." HAHAHAHAHAHAHA! I think you and I are the only people who feel that way! "If I don't talk to you before then, have a Happy New Year!" You too, buddy! And have a super time on your trip to Nevada! "I'm still in the deep South, so no snow here, but at least I can "enjoy" the snow your blog will be decorated in soon. And if you really want a Southern winter scene, just say the word and I'll send you one!" Yes, absolutely....send it in! The photographs can be from any kind winter from anywhere in world. They don't have to have SNOW in them. Looking forward to seeing what you submit, dear lady! Okay Ron, I will do my best to submit a photograph for this photo share. Now that I have a camera, there is no excuse, right? By the way, I love your photograph of the sparrows. Great shot, dude!
" I will do my best to submit a photograph for this photo share. Now that I have a camera, there is no excuse, right?" Yaaaaaahoooo! And yes, now that you finally have a camera, there is no excuse. I am so looking forward to seeing what you submit, Matt. You GO, boy! And thank you. I took that shot of the sparrows about two years ago. Aren't they cute? I love sparrows! Thanks so much for stopping by, buddy. And Happy New Year to you too! Things always look so fresh, crisp and pretty after heavy snow and it's a joy to walk in. Sorry I don't have any winter photos to show you but I'm sure at some point London will be covered in it. Can't wait to see what everyone else comes up with. Ron, it's been a pleasure and I'm wishing you a very Happy New Year. "Things always look so fresh, crisp and pretty after heavy snow and it's a joy to walk in." It sure does, doesn't it? And also for making SNOW ANGELS!!! "Ron, it's been a pleasure and I'm wishing you a very Happy New Year." Same here, buddy. And Happy New Year to you too! "(at least until the slush from driving makes it dirty looking)"
HA! And especially in a city because the streets end up looking like black SLUSH! Oh, but it's so nice beforehand. Much thanks for stopping by, Benze! Have a super weekend! Ron, as you know, I don't own a camera but am looking forward to seeing what your readers submit for this photo share because they're always so great! Your three photos here are fantastic! I really like the one of the little boy making the snowman. He looks so intent! I'm still waiting for our first really good snowfall! "am looking forward to seeing what your readers submit for this photo share because they're always so great!" Me too! I've already had some submissions and they're awesome. Can't wait to share them!
" 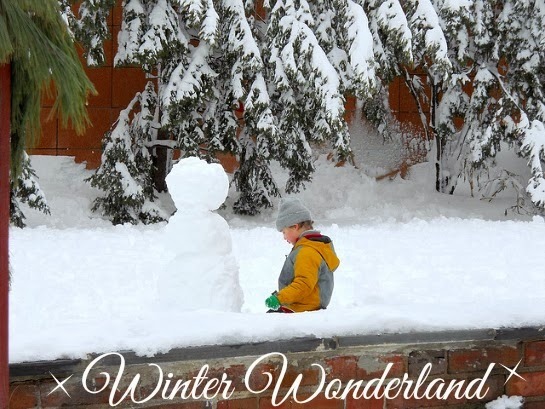 I really like the one of the little boy making the snowman. He looks so intent!" HA! Yes, he does, doesn't he? I took that photograph about two years ago in Society Hill. And when I spotted him making that snowman, I just had to snap it! "I'm still waiting for our first really good snowfall!" We got some on Christmas eve, but it didn't last. That's okay though, because I know Jan and Feb. can be very good snow months! Thanks for stopping by, buddy. Have a terrific weekend! 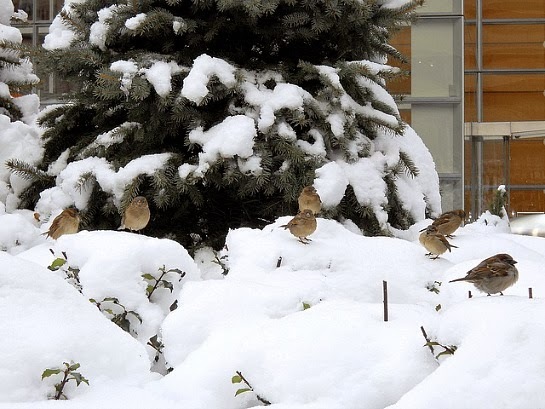 The Sparrows in the snow brought a smile to my face. So did the little boy and his snowman. Lately we've had bright, warm sunshine during the day and cold nights. Rarely, we get snow. I like to watching it fall and how it makes the world look but that's the extent of my appreciation of Winter. To each his own. "The Sparrows in the snow brought a smile to my face." Meee too! So I had to snap a photo of them. I love sparrows! They're the cutest, sweetest little birdies. "Lately we've had bright, warm sunshine during the day and cold nights." Right before Christmas we had temps. in the 70's and very humid, then suddenly got hit with freezing temps. and a bit of snow. Christmas day was bright and sunny, and cold. Perfect day!
" I like to watching it fall and how it makes the world look but that's the extent of my appreciation of Winter. To each his own." HA! I know. I think most people feel the same as you. I'm a NUT for winter. And it's funny because I lived in Florida for 20 years and used to love the warm weather. Thank you. 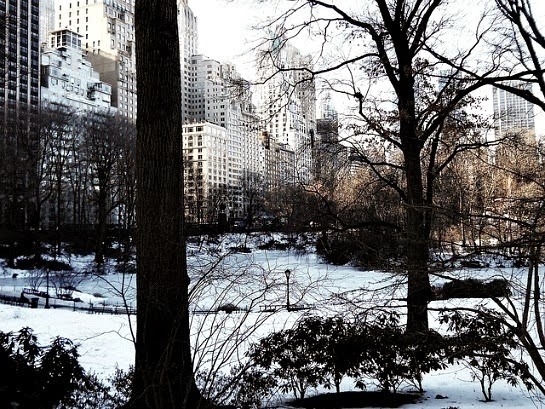 I took that shot of Central Park about 2 years ago when I went to NYC for the day in January. It was freezing that day. ".I enjoy winter from the INside. I am not a fan of the cold...and the cold also does quite a number on my asthma!! Wow really? And I would think that the cold would be better for asthma, rather than the heat and humidity of summer. "Hope you had a nice Christmas and got some rest after the Retail RUSH!!" Yes, I had a nice Christmas day - quiet and restful. It was lovely. I work one more day (today) and then have off for the whole month of January. Yahoooooooooo! Hope your Christmas day was lovely too! ".HAPPY New Year my friend!! SOOOO glad we got to know each other this year!! May 2014 bring much joy!!" Ditto to you, my friend! Much thanks for stopping by. Have a FABU weekend! Ron, I think you just enjoy life! I love that in people. It was a happy day when I found your blog. Aw..thank you for you kind words, Dave. And I'm happy I found your blog as well! hmm, what does winter mean. to me when winter comes, i feel like that naked indian in the commercial on the beach looking at the pollution. i want to cry. i will give this one a try though. i'm glad it doesn't mean snow. winter is depressing. "to me when winter comes, i feel like that naked indian in the commercial on the beach looking at the pollution." Bwhahahahahahahaha! OMG Val, that was HILARIOUS!!!! I know, I know, you're not fond of winter. And so aren't many other people as well.
" i will give this one a try though. i'm glad it doesn't mean snow. winter is depressing." Yaaaaaaaaay! Goodie! And no, the photos don't have to have SNOW in them. They only need to be a picture of a scene or image shot during the winter season. So glad you're going to submit a photograph, girl. And I look forward to seeing what it is. Thanks for stopping by, Val!
" Those little birds in the snow are just the cutest things. I am sucker for birds in the snow." Thank you. Aren't they the most precious little things you've ever seen? I love sparrows because they're so small and cute! "We don't get near enough around these parts, but when we do. I grab my camera!! :-)"
I agree! When I lived in Florida, we had NO snow. So now that I'm back in the north east, the second it snows I'm out there with my camera! Much thanks for stopping by, my friend. Hope you're enjoying a beautiful weekend! Is falsifying the season permitted? Bwhahahahahhaha! OMG Bijoux, I LOVED your comment!! And yes, it IS permitted. Btw, I just checked my emails and got your photo with caption. HILARIOUS!!!!! Can't wait to post it with the others! That's GREAT, Herman! I was so hoping you would submit a photograph for this theme! Can't wait to see what you come up with! Thanks so much for stopping by, buddy. I hope you and the family had a VERY Merry Christmas! I will do my best to capture the desert in winter! Stay tuned! Yahooooo! Looking forward to it, Jean! And thanks for stopping by, my friend! Ron, I don't have a blog, so what should I do if I decided to send in a photograph? Hey Matt, you can send in your photo and use your Facebook account link or any other social media platform you use. I'll link your photo to whatever you choose. I too love winter - for all the reasons you mentioned. Thanks for sharing this. "I too love winter - for all the reasons you mentioned." Yahooooooo! Another winter lover! There are not many of us. Have a super week and Happy New Year to you! "While I don't share your enthusiasm for winter, I do see the beauty in it. " 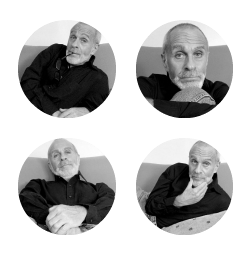 And yes, I just got your photo in my email box. LOVE it! Thanks for stopping by, girl. And thanks for sharing a photo! See, this is what happens when I go offline for a few weeks. I miss EVERYTHING! And most of all? You! "I miss EVERYTHING! And most of all? You!" And you too, Katherine! I've missed you in blogland, girl! I've been wondering if everything was okay. Hope all is well!